Between 1854 and 1929 over 250,000 orphans and unwanted children were taken out of New York City and given away at train stations across America. Originally organized by minister Charles Loring Brace to rid New York of homeless street children and provide them with an opportunity to find new homes in the developing Midwest, this nearly eighty year experiment in child migration is filled with horror stories and happy endings. The last train came to Sulphur Springs, Texas in 1929. The trains stopped in pre-selected towns where people interested in taking a child would assemble. The children were lined up on the platform or a meeting hall stage, encouraged to perform or sing to endear them to prospective takers and were inspected, often prodded and poked to determine whether or not they would be good workers on farms or local businesses. 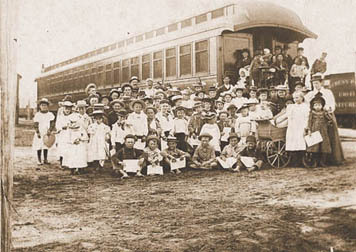 Children not chosen were put back on the train and many were shuttled from family to family and town to town. Until the release of a 1993 documentary on PBS's The American Experience, these children's stories were largely untold.